General Electric‘s ongoing online video plans have crossed paths with Fullscreen. The multination corporation and the digital media company have teamed up for a “creator-in-residence” program that will produce fun and educational science content. The first creator-in-residence is Sally Le Page, an Oxford University PhD candidate who runs a small but delightfully dorky YouTube channel of her own. 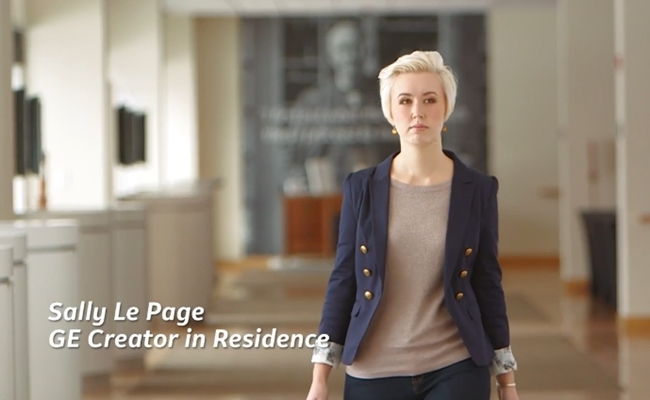 As part of the program, Le Page has traveled to GE’s American facilities, where she will use the corporation’s technology to explore pop-culture topics. During a panel at SXSW, Le Page shared the first series that will be born out of her collaboration with GE. It’s called Fiction Fast Forward, and it will explore the science behind notable sci-fi creations. Up first is the robot from Chappie, who Le Page will compare to real-life advances in robotics. “In a lot of sci-fi films, people don’t know how much is science and how much is fiction,” she noted. Le Page’s residency is expected to last for three months. Fiction Fast Forward will include six episodes.